"A Walk Back In Time"
Take a look at this building … take a good look with your mind’s eye. Can you see the children sitting at their desk with excitement on their faces, some with their hands raised to their teacher? They knew not to talk to their peers or to speak out of turn, for sometimes punishment would cause their hands to burn. The time they spent in school was so very precious because there was so much else to do. Spring was planting season and fall was the harvest. Don’t forget the chores and the crops that needed to be chopped throughout the summer. The children mastered arithmetic, learned how to read, write and to speak in an intelligent voice, enabling them to carry home knowledge to help their parents who never had the opportunity to attend school and learn outside the home. St. Luke Elementary School was an extension of the community. 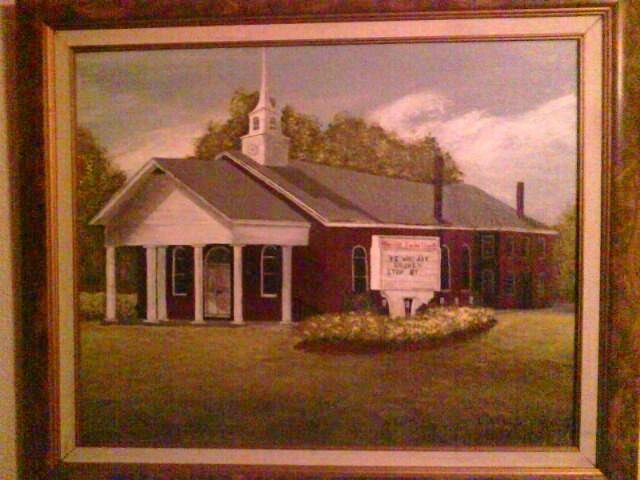 Home, church and school were the the basic foundations for family structure. Community pride was the connecting force held together by the strong faith of the families. The process is continuing today, as the offspring of past generations venture out over the nation, taking with them a part of St. Luke Elementary School. The doors are closed now after over a hundred years of service. The building is silent, sitting alone with memories of love, a humble smile that can only be seen on the faces of those in the community with ties there. Editor’s Note: There are plans to renovate the school in the future. 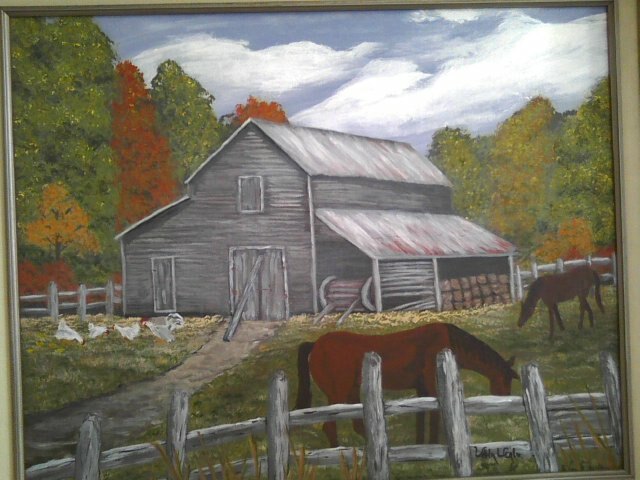 This painting won “Honorable Mention” in one of my first art shows at the Arts Council in Elizabeth City, NC. I was excited just to enter the show, and absolutely thrilled to win a ribbon! This house is located across the road from my house. It is owned by some of the offspring of the original owners. Everyone who lived back here was related in some way. 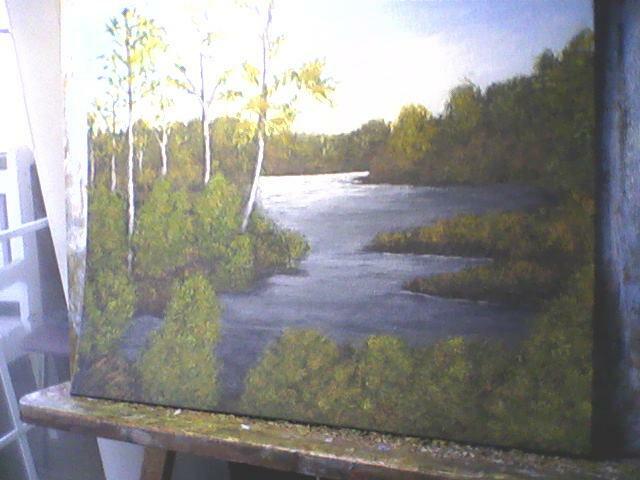 My late husband, one of the land owners/ heirs would spend hours looking over the land. He would get very emotional while telling the history behind it… how his great great grandparents worked the farm during slavery, and were blessed to buy all of it when they were freed. 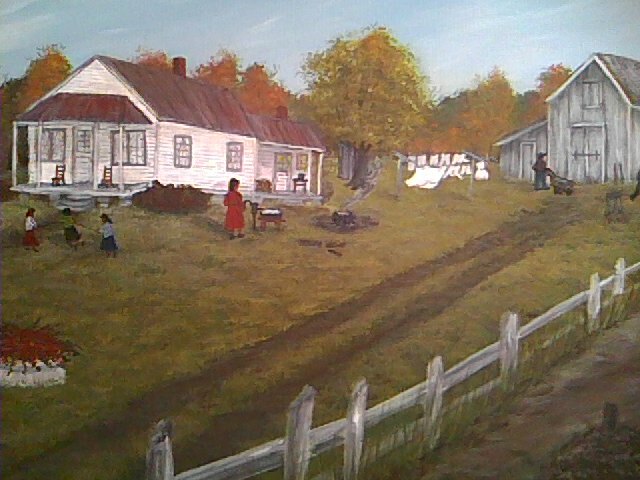 While talking with a family member (whose parents built this house) about the way things were back then, once again, using my imagination, I started to paint. A fitting name came to mind, “THEN.” The judge at the art show liked the name. His encouragement was a big inspiration to me. I was entering a new phase in my life, one that allowed me to express myself. Burdened, heavy with the hand that life had dealt. Or wonder what tomorrow will bring. “Let’s go to church, the kind that you like” were the words I heard. Prayer was the only Sanctuary that I had. Met by the Holy Spirit as I stepped from the car. Started to melt my prison wall. People that I’ll never forget. “Welcome” came so easy, they meant every word. I began to understand the powerful meaning it has. Lighter and lighter I seemed to grow. The Message from inside the church rang clear – BE ENCOURAGED, GOD IS HERE! A growing glimpse of God’s caring love. Strength in Him to carry on. He is waiting, let Him in. This house, listed in the tax office of Bertie County (NC) as THE BETTY VEALE HOME PLACE, is believed to be one of the oldest houses standing at the present time in the Lewiston community, having been built during slavery time. I’ve been told by family members that there are census records showing that members of the Veale family were slaves on this farm. One slave, named Africa, was thought to be the monarch of the band of slaves. The Veale slaves, last name given by their owners, were recognized in the census as early as the 1880’s. After the slaves were freed, they bought the land from their former owners. The farm was divided into sections and passed down to heirs – generation after generation. Over a period of time, some of the land was sold to outside interests. My late husband James A. Veale, Sr., adored the “OPENING,” a section of the land that was cleared with no trees, vowing, when his family moved to Baltimore when he was a child, to return upon his retirement. He never forgot his dream, always keeping it in his plans as an adult. He realized his dream, was blessed by God to return to his land, work his soil, watch his many trees, plants and huge garden grow, and watch the magnificent views afforded by nature, through the changing seasons. This home has witnessed many, many births and deaths, and was the site of the first Veale Family Reunion. The winding road running through the farm carries the honored name “VEALE FIELD ROAD.” The legacy of this community has so much history, letting present as well as future generations know that goals can be accomplished when people are united as a family, community and kindred souls. Knowing that the original Veale owners (who were former slaves with very little formal education) realized that they had the formula for success: a gift of common sense, a strong desire to achieve, coupled with strong moral values, a total belief in God, along with much hard work, lets us know what can still be done today and that the Veale descendants are obligated to pass it on. John B. 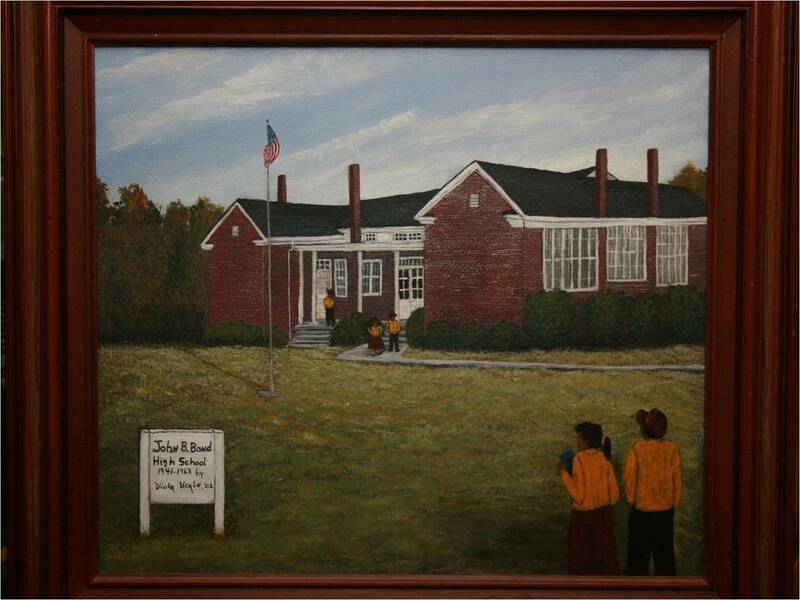 Bond High School was a legend of cultural awareness with an exceptional focus on the importance of reaching for the highest goals possible. Innocent children were entrusted in its care, and this institution nurtured and taught them to realize the self-worth that they each possessed. For years, students were exposed to the best, most recent instruction of the period. Many JOHN B. BOND HIGH SCHOOL alumni still organize class reunions, some consisting of individual classes and a grand entire school reunion is held on Thanksgiving weekend every two years. Although my late husband James’ family relocated just before his senior year, he never lost his passionate love for his precious “John Bond” or his beloved teachers. While driving through the countryside of Wendell, North Carolina, I saw a lake in the distance, behind a beautiful house. I didn’t see a name, just a breathtaking view. The scene was too beautiful to ignore – I was mesmerized. As always, my mind’s eye started to see beyond what was actually there. I began to envision ducks, geese, birds and deer taking REFUGE in the thick bushes and trees, safe and protected from the harm that lurked all around. Webster’s dictionary defines REFUGE as a place that provides shelter and protection, something to which one has recourse in difficulty. The description was very fitting, with thick underbrush and vines on the bank of the lake, seemingly making entrance unappealing and difficult to gain a foothold for humans. I saw ducks floating along the marsh, taking a break in their migration to other areas. Food was plentiful and the water gleamed in the autumn sun, full of fish that were jumping, putting on a spectacular show. It’s funny how peaceful and worry-free animals seem, accepting with grace the provisions there for them, enjoying the moment. Nature really put on a show of color among the trees, hues of earthy vibrant brown, green, yellow and dark red. Taking time to stop, look and meditate on the One responsible has a healing effect, a calming effect and lets us know how to find A REFUGE in our lives. Farmers, I am told, get up to feed their animals and start their work at the crack of dawn. When the weather permitted, farmers and animals worked very hard. When I was a child, at summer vacation I would visit friends who lived on a farm. Being a town kid, I wasn’t allowed in the fields and my help was not appreciated because my skills were less than desirable. How do I know? One day, I had a chance to chop some corn. All of it, corn and grass, looked the same to me as I chopped. Let’s just say that ended my career of farming! Break time was worth waiting for – a big meal, southern style, complete with dessert (molasses pudding). The farm animals were given a break too, and they were fed, watered and allowed to rest and cool down until the time came to go back to the fields. I can still see them with my mind’s eye, contentedly eating and lounging around the barn yard, enjoying their – BREAK TIME.